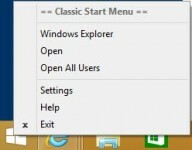 Recently a friend shared a bit of information about dealing with the missing start menu in Windows 8. It got me thinking that many people might not be aware of this method and my own prefered method using third party software. 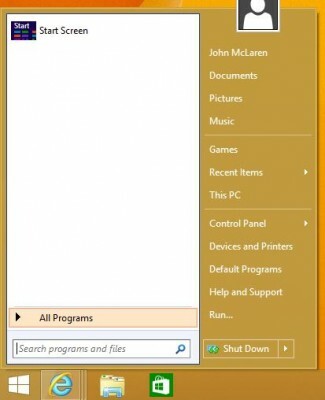 After the release of Windows 8 a flood of third party tools hit the internet to return your start menu. These tools are a mix of pay for and free, some perfectly replicate the older start menus and some don’t even come close. Here is what I use now that the dust has settled and I’ve tried all the options I can get my hands on. 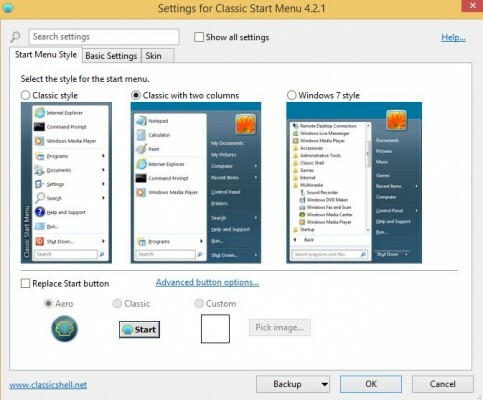 Classic Start is a full start menu replacement for Windows 8 that almost perfectly replicated the old start menu experience with options that allow you to customize it even further. Choose the style of menu you prefer (I prefer Windows 7 Style). Customize other options in the basic settings tab if you desire. Also, advanced settings can be found by clicking the “Show all settings” option near the top. That’s it! now you have a start menu just the way you want it. For a very long time you’ve been able to attach a folder to the windows taskbar. After adding a folder, clicking it will display a menu of all the files and folders in that menu. The windows Start Menu is mostly just a series of organizes files and folders and while the menu is gone from 8 and 8.1, the folders are still present. Check out this article with some more detailed instructions.